Fans of woodwork are always able to see the endless possibilities that pallets offer. With a little bit of sweat and creativity, you can bring a beautiful and totally free addition to your room with only pallets. Put your wooden pallets to use instead of letting them just lying around in the yard. Arrange the shape of your bench. Attach the four legs to the sitting are with strong bolts. When you finish putting it all together, sand it and coat it with stain with the color of your choice. You can also add a little storage room for your shoes under it by adding a shelf. 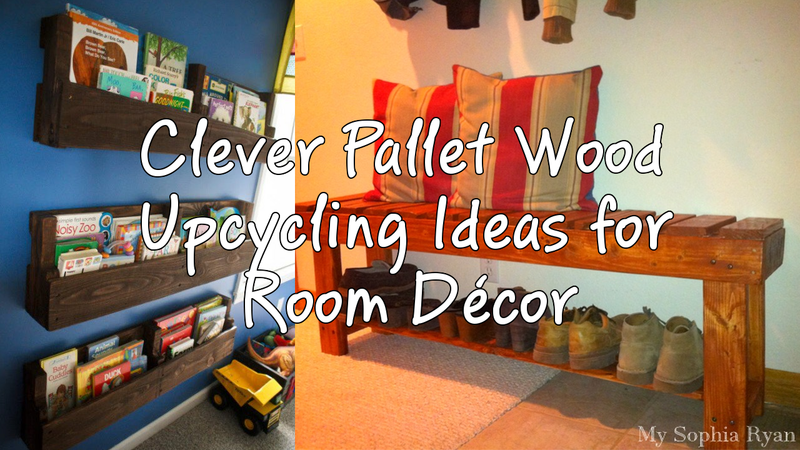 Get yourself one more sitting area with this clever Pallet Wood Upcycling Idea. Your old pallets are potentials shelving unit for your room. Attach them to the wall brackets and display your antique collection there. It’s way better and more space-saving than placing your collection in glass cabinets. Paint a new color to give the pallets a new lease on life and remember that it’s best to go with the color that matches the stuff you’re going to put there for the sake of artistic visualization. If your cabinets are already full but you still need place to store your pots and pans then make your own storage out of pallets. Just add hooks! It will turn out as a useful shelf too to set your pots on. You can also cut them into smaller sections and add a bottom and they will transform into shelves to stash your cooking utensils. When your bathroom is bursting at seams, it makes your bathing activity a little less comforting. Get every shower caddies and towels organized by storing them in simple storage you can make with only pallets. Make use of the blank space in your bathroom by building a basic pallet to store your shower caddies. A mounted pallet board always works if a teeny-tiny bathroom is all you’ve got. Attach glass jars on top of your pallet board to stash your items. However, if you want everything to be within your reach, you can opt for convenient pallet compartments by cutting them into smaller sections and adding a bottom. Attach them on the gap between your sink and cabinet. These shelves become handy to store your brushes, toothbrushes, lotions, and all your little shower necessities. Your kids might not have an extensive collection of books yet so buying an expensive mahogany bookshelf seems a little useless. However, their comic books collection need a place to be stacked. Get your kids a little bookshelf to store their comics by doing a little woodwork. Make yourself a single pallet and mount it on the wall to stack the books. Secure it with bolts or brackets.